you see the foreign policy positions of the previous and current administration in a new light. See as citizens and voters in this representative democracy we have a responsibility to look beyond the “hot button” issues of the day (economy & religious freedom) and think about the idea that, like it or not, we are part of a global community and our standing in the world affects every aspect our American life. Therefore, the US must remain a global force for good which holds fast to foundational principles grounded firmly in the Judeo-Christian ethic. In addition, we must understand that when we compromise those moral principles, for whatever reason (i.e. consequentialism), we hamstring our own development and our ability to operate freely (& influentially) on the global stage. Now, as a point of fact, I will review some of the concerns brought up in the Carter article that should be of concern for Catholics and others of good will during this election season. The excuses used to approve such grotesque and illegal techniques began under the Bush administration and have escalated under the Obama administration further jeopardizing our ability to hinder terrorism. As a matter of fact, military and non-military personnel have agreed that “the escalation in drone attacks has turned aggrieved families toward terrorist organizations, aroused civilian populations against us and permitted repressive governments to cite such actions to justify their own despotic behavior” according the Carter’s article. We should care that actions being employed for “our protection” are actually turning those in foreign lands against us compromising our ability to keep our families safe in the homeland. As Catholics we need to stand up and allow our collective voices to be heard when policies, developed and enacted by our representatives, violate principles rooted deep within our Christian faith. 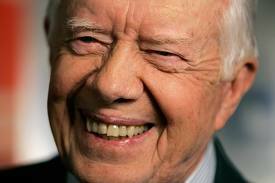 It should not be left up to President Jimmy Carter to be the lone, public voice of concern regarding issues of such significance. I am proud that our religious leaders have been standing up against the attacks on our religious freedoms, their concerns relating to moral / religious violations embedded within the Affordable Care Act and their continued stand for the Dignity of Life. However, I am cricital when other issues that require careful consideration do not get the attention they deserve (or command) simply because they are not the “hot button” political topics that play well in the press or among certain segments of the faithful. Catholics – we need to retake the high ground and shout loud this election season regarding the serious issues that we are being confronted with from EVERY segment of our society and within the current areligious culture. My one concern regarding this post is pulled from the “Just War Theory”. In that teaching of the Church, it remains to the “competent authority” to analyze the threat and act accordingly. We do not, for security reasons, have all the information our government leaders are working from. While I agree that “collateral damage” in the form of innocent civilians IS a travesty of justice, I know there is more to what is going on than we – including former presidents – have knowledge of. In the cause of full disclosure, I was a Marine Corps chaplain during Desert Storm. I know from first-hand experience that not all information was disclosed then regarding the actions taken. I seriously doubt the situation has changed regarding disclosure in the last 20 years. I do appreciate your response. I do agree with the statement that, “we do not have all the information our government” has regarding global threats of terrorism / violence. However, focusing on that fact really distracts from the heart of the article. We cannot afford nor is it acceptable to attack in the same way / with the same methods as we are being attacked. In addition, we are using the excuse of being attacked or the possibility of being attacked as an excuse to liberalize the rules of engagement. In addition, competent authority is not the only criteria for engagement in a Just War. I have placed a ton of links in this article which express support for my conclusions. A great book, especially for evaluating EIT’s, is The Black Banners. The author was one of our top agents on the JTTF before, during and after 9/11. Partly Cloudy is a look at the ethics of covert actions including EIT’s although the author shy’s aways from developing a definitive conclusion as to the ethic of such activities. In addition, many from the Left to the Right have evaluated the NDAA 2012 and have found many items very concerning including the indefinite detention to suspects and the widening of the scope of the War on Terrorism to the United States. Lose our moral standing and reject the principles of Just War and we are in serious trouble. We might not “feel it” now – but we will in the near future.